“Chorizo de Bilbao” at iba pa.. When we were young, we learned about the Philippine history, culture, social life, etc. We were also made to believe about some things that in reality were inexistent. But since we were still young, such information got stuck in our mind and they were just accepted as how we learned them to be. All the while, we were growing up with all those pieces of information and we didn’t bother ourselves as to their authentic truth or origin. Well, we did not enjoy the benefit of the Internet then, so that information was less available before as it is right now. Take for instance the title of this post – Chorizo de Bilbao -. As far as what we learned before, that Chorizo de Bilbao is a type of sausage that comes from Bilbao, Spain. 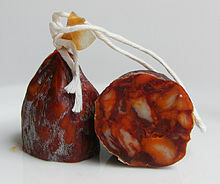 In reality, there is no such Chorizo de Bilbao in Spain!. Filipinos living here in Spain, know this full well. It is almost the first thing a Filipino would ask for upon setting his foot in Spain. Well, we have to admit, that Chorizo de Bilbao sold in the Philippines really tasted good. There is no denying about that. But where did that chorizo come from, if it did not originate from Spain? I’ve searched the Internet and what you get are recipes on how to make Chorizo de Bilbao. And the closest opinion to the truth comes from Wikipedia that “it was a Filipino invention which variant cannot be found in Spain”. So case closed. Do not believe that Chorizo de Bilbao is imported from Spain. There is no such “chorizo” in Spain, although there is a city called Bilbao in the northern part ofSpain. Next point to pounder on: – Manton de Manila. 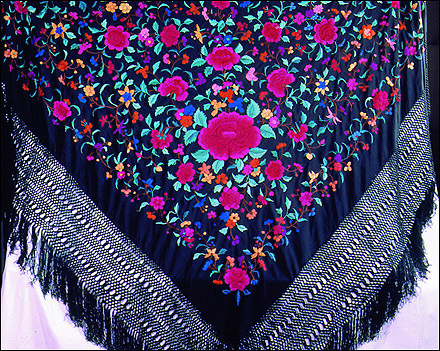 That elegant looking shawl, made of fine silk and embroidered with different designs of flowers, etc., and not to mention the variant colours. It’s an indispensable clothing of the Spanish women whenever a town fiesta is held, because it is elegant in style, classy and a useful alternative to a jacket specially when the weather is cool. But where is the origin of Manton de Manila? It was actually made in China. So history says that when the Galleon trade was started in 1565, the route from Manila to Mexico was discovered by Andres de Urdaneta. The route passed the northern Pacific to the California coast and then down to Acapulco in Mexico. The Spanish king then allowed the Filipinos to trade with Chinese in Canton. They brought silks, ivory, furniture, porcelain, spices from Canton. The Galleon went to Acapulco once or twice a year through that route. One of the items that came from Canton to Manila was the silk shawl. It was a square piece of cloth with a lot of embroidery. It was folded half like a triangle and was worn over the shoulders of women. The shawl became known as Manton de Manila, although it was not made in Manila, but was made in Canton. The Philippines never had a silk industry. The manton de Manila soon became very popular in Seville, Andalucia and in Latin America. This piece of history would tell us therefore, that although the Manton never originated from Manila, it has made a name for Manila, and Manila should be proud of being attributed that piece of cloth that gives elegance and beauty to a lot of women in Spain and elsewhere in the world. The third point is about Ferdinand Magellan and Lapu-lapu. Philippine history taught us that Ferdinand Magellan, who discovered the Philippines on 16 March 1521, was “killed” by Lapu-Lapu. 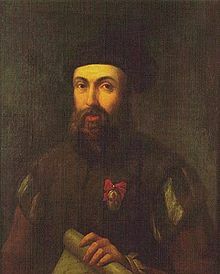 The only chronicle about what happened in Mactan was written by Antonio Pigafetta, who survived the Battle of Mactan. But, was it true that Lapu-lapu killed Magellan? Well, the contrary was clearly stated by Pigafetta, who wrote the accounts of the battle and how Magellan ACTUALLY DIED: “When the natives saw that we were shooting our muskets to no purpose, crying out they determined to stand firm, but they redoubled their shouts. When our muskets were discharged, the natives would never stand still, but leaped hither and thither, covering themselves with their shields. They shot so many arrows at us and hurled so many bamboo spears (some of them tipped with iron) at the captain-general (Magellan), besides pointed stakes hardened with fire, stones, and mud, that we could scarcely defend ourselves….”. So, folks make your own conclusions, did Lapu-lapu actually killed Magellan, while Pigafetta pictured something else. Draw you own conclusions.